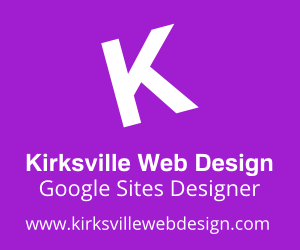 Kyle here with Kirksville Web Design and another Google Sites update. The Google Apps teams is always kind enough to announce changes and roll them out slowly. Sometimes you'll stumble upon them randomly and say 'woah didn't know that was there.' Then you question yourself as to maybe it was there all along and you are losing your mind. Anyways, this is another smallish update to Sites (I haven't been too terribly excited since horizontal navigation rolled out 8/19/2010). There have been several occasions where I have recommended the use of Google Groups Discussion Forums. Since the beautification of this tool, it has garnered more recognition. It was always a hassle to direct clients to More Gadgets, so this is convenient. It's still a bit clunky to setup I think. You need to setup the group, grab the url, and throw it in the gadget. You've easily wasted 10 minutes just to get a commenting functionality. To fix this, I would like to see the insert of the Google Groups Discussion Forum streamlined. I tried creating a drawing in Google Docs and didn't like it too much. So being able to insert a drawing into my Google Site doesn't appeal too much to me. I can see it being useful for wireframe drawings, flowcharts, but nothing too fancy. Any thoughts on Drawings in Google Docs, then embedded into Google Sites? Who doesn't love to see how their upload is coming along? Great feature that is appreciated for those larger file uploads. Another feature that could be added is a multiple file upload capability. It's a drag to add files one-by-one. I did find a great solution in Cloud Sherpas Mass Upload Tool. It's free for 5 files at a time. Thanks + Cloud Sherpas for that one. 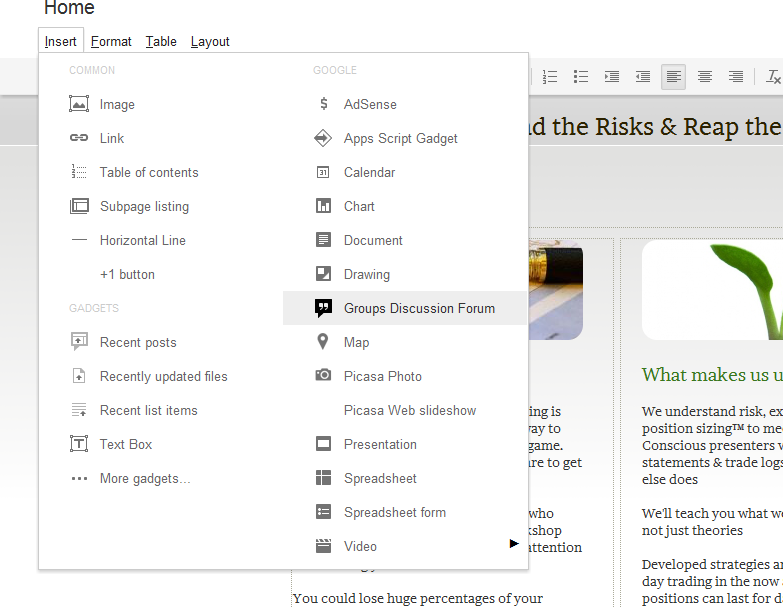 - Groups Discussion Forums can be inserted via the ‘insert’ menu. - Drawings gadget: Drawings can be inserted as a gadget via the ‘insert’ menu when editing a page. Regarding the insert of drawing is it possible to say create a website mock up in photoshop and have that serve as the webpage? Maybe you would have to create every page, but it would lend itself too more artistic pages. Or maybe Google Docs? Maybe just graphic elements so you can use the rest of the html capabilities of the page such as embedding media or having social media aspects? I know very little of web design as I am a print designer.